Amazing stuff in the Queen Anne with Canford Cliffs showing that he’s ready for primetime and then some. The time and pace seemed fast to me just visually. Goldikova travelled super well and just got run down by Canford Cliffs on the square. 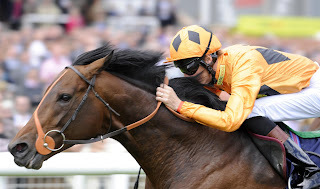 Interesting to note that Cape Blanco seemed to be ridden as a pure pacemaker (the Coolmore boys own him and have bought into Canford Cliffs as well). Of course, Goldikova had a pacemaker of her own so you can’t say that gave Canford Cliffs any edge. Jockey Olivier Peslier reported in two pounds over (seemingly VERY poor form) but I doubt that was the difference so no real controversy for me there. It was just a great race all around and Canford Cliffs was certainly better on the day. Richard Hannon (trainer of Canford Cliffs): “[Goldikova’s] obviously brilliant, but [Canford Cliffs’] is a good horse and we had to take her on. Two pacemakers in there, he followed the filly. He’s got a good cruising speed and can also quicken. He’s a very special horse. Richard Hughes (jockey of Canford Cliffs): “A bit of cat and mouse in there. [Peslier] wouldn’t kick, and I couldn’t kick ‘til he kicked. Freddy Head (trainer of Goldikova): “It’s a tough mile for her here. As for the ST. JAMES PALACE, Frankel made his move awfully early and his final margin of victory might not reflect his true superiority. The best news for Frankel fans, in the words of his rider. I think if held up a bit more, the 10 furlong distance will be within his grasp. His trainer indicated that the Sussex Stakes (1 mile versus elders, including Canford Cliffs, could be next) and maybe after that they’d try the Juddmonte International at York at 1 ¼ miles (presumably against Carlton House, maybe So You Think and Planteur). The strong gallop out suggests that there might be something to Queally and Cecil’s comments, though I do think Frankel would look better late in the race with a little more even energy distribution. I am sticking to my guns that FRANKEL is special, and am hoping we haven’t seen the best of him yet. I’ll update this piece or write a follow up if I gain access to hand-timed sectionals. One final note. After the races each day at Royal Ascot, there is a patriotic sing-a-long (no, really). Here is a clip from last year.